If you played the original, Where’s My Water? 2 will be very familiar. 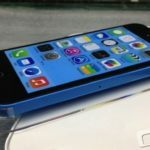 However, there are a number of differences that make this sequel worth your time. Just like in Where’s My Water? 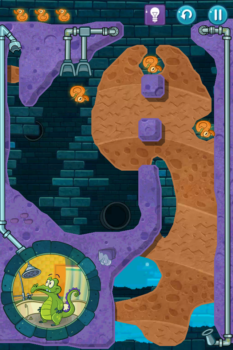 your goal in each level is to get the water to Swampy or one of his friends and collect ducks along the way. Actually, in 2 you’re not always collecting ducks, because after you complete a level you unlock a challenge that changes the way you play it. 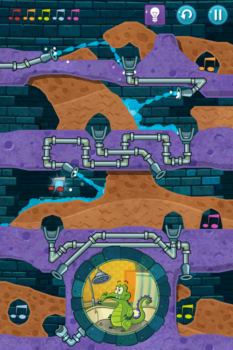 Challenges can be avoiding ducks, playing the level upside down with gravity reversed or even collecting music notes in a particular order. 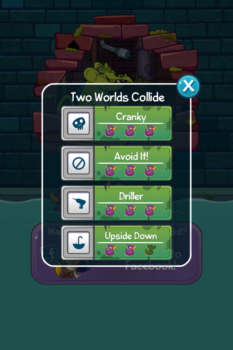 Also, like many other free-to-play games there are power-ups in Where’s My Water? 2, such as the Vacuum that pulls water towards ducks. The power-ups effectively make collecting ducks easier, and as you may have expected, you’re given only a few for free. Considering the game is free, I didn’t mind having to stop and wait 5 minutes for my energy meter to refill after playing a few levels. Although, I think the energy meter doesn’t fit in this game world. I mean what is the energy powering? A pump? A pump that pushes the water, steam or other fluid into the levels? Anyway, I did like the introduction of the challenges, as they gave me a new and interesting way to play levels. I believe they make Where’s My Water? 2 a great game and worth your time. If you’re looking for a new puzzle game Where’s My Water? 2 will give you hours of challenges that you can chew through a few minutes at a time. 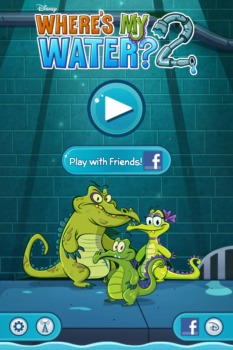 You can download Where’s My Water? 2 for free from the App Store here. Then, tell us if you would prefer to play the original Where’s My Water or this sequel.